It is good to pray alone but two are definitely better. It’s good to stand in the gap for your family, husband, children, . . .all by yourself. It’s good to be a lone prayer champion but when two are involved, a greater reward is certain. Your spouse should be your prayer partner; even if you have other prayer partners. The power of two. God abides in a place where there’s agreement. Ever wondered the scripture emphatically says that God is in the midst of two or three that gather in His name. 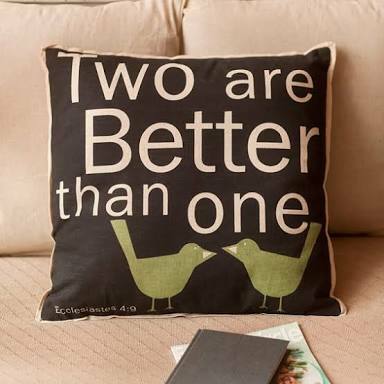 Two are better than one, Because they have a good reward for their labor. For if they fall, one will lift up his companion. But woe to him who is alone when he falls, For he has no one to help him up. Again, if two lie down together, they will keep warm; But how can one be warm alone? Though one may be overpowered by another, two can withstand him. And a threefold cord is not quickly broken (Ecclesiastes 4:9-12). Join forces with your husband. Your reward will somersault in in geometric progression. The Bible tells us that one shall chase a thousand while two will chase ten thousand. Can you beat that? Normally, we should have expected two to chase two thousand. That’s the greater reward we’re talking about. God multiplies your prayers. He magnifies your reward when you seek Him as a couple. When your husband found you, he received favour from the Lord. So what do you call the ripple effect of prayers by two people who agree together before their heavenly father? What do you call the multiplied reward they receive? I call it favour. Yes, favour takes over from labour when you pray together. You do less work and reap a greater harvest. You get much more than your expectation. Praying together binds your spirits together. For me, when my husband and I pray together and worship God, I have this feeling of closeness to him. I feel a stronger attachment. Really, when we hold hands in prayers, it speaks the greatest volume of romance to me. I don’t really know how to explain it. Take time to pray TOGETHER constantly. It sure doesn’t stop your personal prayers. Don’t ignore the power of two. I encourage you to make a habit of it. Encourage each other to pray together. May the Lord cause you to walk in agreement with your spouse in Jesus’ name!